You’ve probably heard that the air inside our homes is significantly more polluted than the air outside. In fact, some studies say it is three to five times as polluted. And our indoor air quality gets worse during the summer and winter months as we keep our windows and doors shut, trapping allergens and pollutants inside. To keep the air inside your home as clean as possible, filter it with a high-quality air purifier and air purifying plants. True HEPA filters are highly effective at removing very small pollutant particles such as tobacco smoke, dust and pollen. And activated carbon filters absorb certain VOCs and other gas and chemical particulates from the air. To best clean the air in your home, look for an air purifier that contains both a HEPA filter and an activated carbon filter. 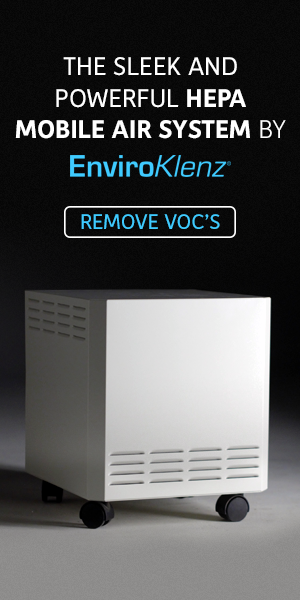 Ideally, your air purifier will also have a CADR (Clean Air Delivery Rate) of at least 200 cubic feet per minute. Astronauts can’t exactly pop open the windows on the space shuttle when things get a little stuffy, so NASA did a study to identify plants that helped to clean toxins from the air. It turns out that certain houseplants, particularly those that require low amounts of light, proved quite useful in their ability to absorb airborne pollutants and improve indoor air quality. Here are a few that did well in their study and that you may want in your own home: Chrysanthemums (potted mums), Gerbera Daisies, English Ivy, Golden Pothos and Dracaena. (They tested the Marginata, Warnecki and “Janet Craig” varieties of Dracaena, though others may work just as well). In addition to filtering the air inside your home, you can also incorporate a few simple practices to help reduce the level of pollutants that build up in the first place. Here is where most of our indoor air pollution comes from and how you can keep your home’s air cleaner. Shoes & Floors – We constantly track bacteria and viruses into the house from the bottom of our shoes. Wipe your feet on a doormat when you come inside and leave your shoes at the door. It’s also a good idea to invest in a vacuum with a good HEPA filter and use it weekly, at minimum. You’ll also want to clean wood and tile floors regularly with white vinegar to kill germs. Cleaning Products – Minimize or eliminate cleaning products that contain chemicals. Use natural home cleaners such as baking soda and white vinegar, or opt for non-toxic cleansers made from plant and mineral ingredients. Scented Candles – Skip any air freshener or scented candle that lists “fragrance” or “parfum” on the label. As an alternative, choose unscented candles or candles that list essential oils on the label. Better yet, simply diffuse organic or ethically sourced essential oils and skip the candle altogether. You can also use white vinegar and baking soda, instead of odor-masking chemicals, to naturally deodorize your home. Dry Cleaning – Formaldehyde and other harmful chemicals can leach from dry cleaned clothing into your car and home and dirty the air. Consider clothing that doesn’t require dry cleaning or leave dry cleaned clothing to air out in the garage or on the patio before bringing them inside. Pet dander, dust mites and pollen – Without fresh air circulating throughout your home, allergen pollutants can become a big issue. Vacuum furniture, flooring, and drapes using a vacuum with a good HEPA filter at least once a week. Cover your mattresses and pillows with tightly woven cotton (which is breathable, but doesn’t let dust mites through) and wash your bedding weekly in hot water (130°F). Lastly, bathe pets regularly to remove dander and wash their beds weekly in hot water. Mold & Mildew – The spores produced by mold and mildew can become airborne and cause issues, so make sure to turn on the exhaust fan or open a widow during showers and let the air circulate for a while afterward, until the humidity clears out. Also, clean your bathroom regularly with white vinegar and hydrogen peroxide to kill any mold that does build up. Fresh Air – Although this can be difficult when it’s cold outside, open windows and doors on occasion to circulate some fresh air through the house, even if it’s just for a few minutes at a time. Smoking Indoors – This is an obvious no-no. Warming up the Car – Never idle your car in an attached garage, because the exhaust can blow into your home. Humidifiers – Heaters are obviously great in winter, but they can really dry the air. A good humidifier can moisten the air, making breathing more comfortable again… but humidifiers can also breed mold and cause certain illnesses such as hypersensitivity pneumonitis and humidifier fever. So be sure to use a humidity meter to monitor the moisture level in your home and keep it below 50%. Also be sure to clean the humidifier regularly and refill it with fresh water daily. Paint – Avoid painting your home with oil or latex during the winter months. If you do want to paint in colder months, use natural paints made from plants, minerals, clay and/or milk. Natural paints are safe to use indoors with the windows closed, because they don’t contain chemicals or emit harmful fumes. Cooking – Use an exhaust fan or open the kitchen windows when cooking, so any smoke is flushed outdoors. Fuel-Burning Appliances – Any appliances that use gas or emit smoke should be well maintained so they don’t emit pollutants into your home. This includes fireplaces, wood-burning stoves, furnaces, clothes dryers, ovens, stoves, space heaters and water heaters. You should also place a few carbon monoxide detectors around your home (especially near bedrooms) to alert you of any problems. Even a single exposure to poor air quality can bring on headaches, sneezing, dry eyes, skin rashes and drowsiness. And children and the elderly can be more severely affected, as well as those suffering from asthma, chemical sensitivities or respiratory-related illnesses such as bronchitis or pneumonia. Long-term exposure to poor air quality is even more dangerous. It can create sensitivities that you wouldn’t have otherwise experienced. And over time it can lead to chronic lung disease and some forms of cancer.